Camo Gear There are 20 products. 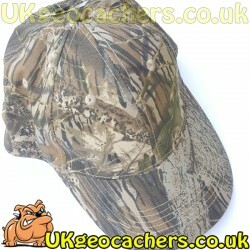 Make your own camoflauge items. 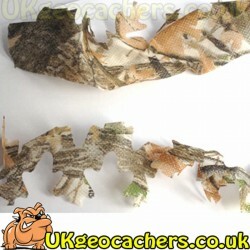 These strips are a great way of making your own camo bags or geocaches. Order 10 or more for an 8% discount. 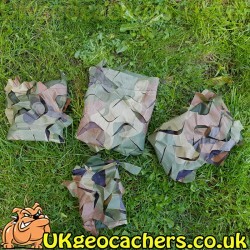 Want a way to camoflauge your geocaches, but don't want to pay for a bag, or don't want to use sticky tape, then this might be just want you need. 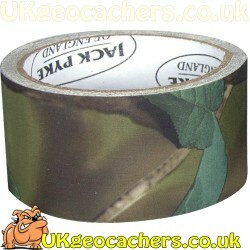 This roll of camouflage tape is a permanent tape with the English woodland design. 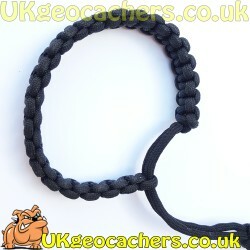 This stunning looking 550 Paracord Mad Max Style braclet is hand made by geocachers in the style worn by Mad Max in the film Fury Road. 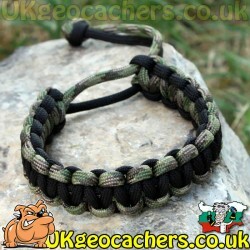 It features almost 3m of top quality paracord and is adjustable. These containers come with an o ring seal to help keep the contents dry. Available in 3 colours. 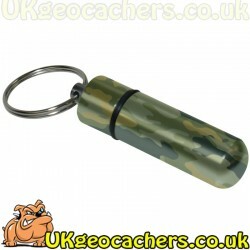 Each has a split ring that you can use to hang or attach the geocache to something, or you may prefer to remove the split ring altogether.